In accounting, the accounts are classified using one of two approaches – modern approach or traditional approach. We shall describe modern approach first because this approach of classification of accounts is used in almost every advanced country. The use of traditional approach is very limited. According to modern approach, the accounts are classified as asset accounts, liability accounts, capital or owner’s equity accounts, withdrawal accounts, revenue/income accounts and expense accounts. Assets are things or items of value owned by a business and are usually divided into tangible or intangible. Tangible assets are physical items such as building, machinery, inventories, receivables, cash, prepaid expenses and advance payments to other parties. Intangible assets normally include non-physical items and rights. Examples of intangible assets include goodwill, trademarks, copyrights, patent rights and brand recognition etc. A separate account for each tangible and intangible asset is maintained by the business to record any increase or decrease in that account. Liabilities are obligations or debts payable to outsiders or creditors. The title of a liability account usually ends with the word “payable”. Examples include accounts payable, bills payable, wages payable, interest payable, rent payable and loan payable etc. Besides these, any revenue received in advance is also a liability of the business and is known as unearned revenue. For example, a marketing firm may receive marketing fee from its client for the forthcoming quarter in advance. Such unearned revenue would be recorded as a liability as long as the related marketing services against it are not provided to the client who has made the advance payment. Capital is the owner’s claim against the assets of the business and is equal to total assets less all liabilities to external parties. The balance in capital account increases with the introduction of new capital and profits earned by the business and decreases as a result of withdrawals and losses sustained by the business. In sole proprietorship, a single capital account titled as owner’s capital account or simply capital account is used. In partnership or firm, each partner has a separate capital account like John’s capital account, Peter’s capital account etc. In corporate form of business there are many owners known as stockholders or shareholders and the title capital stock account is used to record any change in the capital. Withdrawals are cash or assets taken by a business owner for his personal use. In sole proprietorship and partnership, an account titled as drawings account is used to account for all withdrawals. In corporate form of business withdrawals are more systematic and usually termed as distributions to stockholders. The account used for recording such distributions is known as dividend account. Revenue is the inflow of cash as a result of primary activities such as provision of services or sale of goods. The term income usually refers to the net profit of the business derived by deducting all expenses from revenue generated during a particular period of time. However, in accounting and finance, the term is also used to denote all inflows of cash resulted by those activities that are not primary revenue generating activities of the business. For example, a merchandising company may have some investment in an oil company. Any dividend received from oil company would be termed as dividend income rather than dividend revenue. Other examples of income include interest income, rent income and commission income etc. The businesses usually maintain separate accounts for revenues and all incomes earned by them. Any resource expended or service consumed to generate revenue is known as expense. Examples of expenses include salaries expense, rent expense, wages expense, supplies expense, electricity expense, telephone expense, depreciation expense and miscellaneous expense. The accounts related to real persons and organizations are classified as personal accounts. Examples of personal accounts include John’s account, Peter’s account, Procter and Gamble’s account, Vibrant Marketing Agency’s account and City bank’s account etc. The business keeps a separate account for each individual and organization for the purpose of ascertaining the balance due from or due to them. Real accounts are accounts related to assets or properties (both tangible and intangible) owned by a business enterprise. A separate account for each asset is maintained to account for increases and decreases in that asset. Examples of real accounts include cash account, inventory account, investment account, plant account, building account, goodwill account, patent account, copyright account etc. The accounts related to incomes, gains, expenses and losses are classified as nominal accounts.These accounts normally serve the purpose of accumulating data needed for preparing income statement or profit and loss account of the business for a particular period. Examples of nominal accounts include sales account, purchases account, wages account, salaries account, interest account, rent account, gain on sale of fixed assets account and loss on sale of fixed assets account etc. Valuation account (also known as contra account) is an account used to report the carrying value of an asset or liability in the balance sheet. A popular example of valuation account is the accumulated depreciation account. Companies maintaining fixed assets in the books of accounts at their original cost also maintain an accumulated depreciation account for each fixed asset. 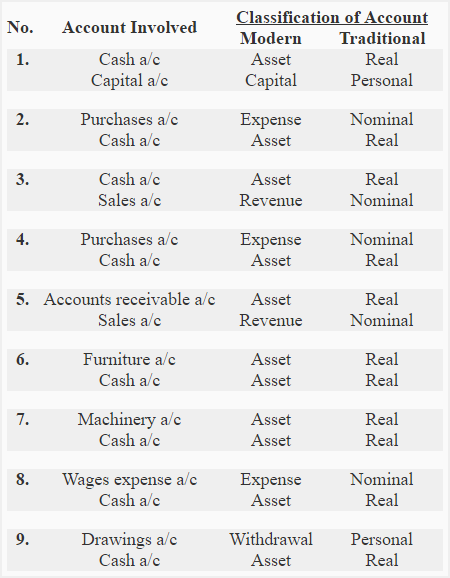 In balance sheet, the balance in the accumulated depreciation account is deducted from the original cost of the asset to report it at its book value or carrying value. Another example of valuation account is allowance for doubtful accounts. In balance sheet, the balance in allowance for doubtful accounts is deducted from the total receivables to report them at their net realizable value or carrying value. Mr. John withdrew $100 from business to pay his personal expenses. Write both in your answer for good marks. Is there any rules for classification of accounts?